You are responsible for researching and reporting on a gaining new knowledge on an aspect of the Civil Rights Movement (1954-1968) and communicating it in the media format of a photo journal. You will be designing pages that include a combination of photographs and text features with an original informative essay to create a collaborative book to share with our school community. 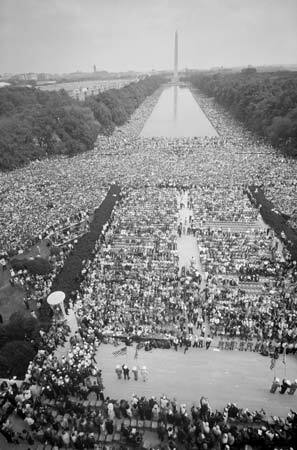 March on Washington. Photograph. Encyclopedia Britannica. Web. 2 Feb. 2013. · Assassination of Martin Luther King, Jr. When and where did this event or topic take place? What or who influenced this event or topic? How did this topic influence or impact the Civil Rights Movement? What was the outcome of this event or topic? Who was associated with being a leader or organizer of this event or topic? What image(s) can best represent this event or topic to others?